Why divide this interview in half? Although I retained the chronology of the interview, and there is much back and forth throughout, the first half thematically focused more on Parvathy’s Baul spiritual path, her work, and her aspirations. I supplemented that interview in Issue 11 with a separate article on Bauls, especially for those unfamiliar with them. 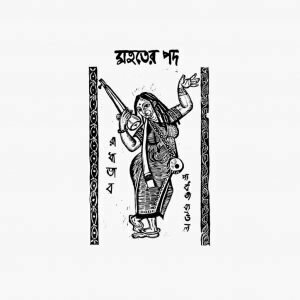 In this half, similar themes emerge, but what struck me most was the connection between her own story and that of Shuddhashar’s editor and publisher, and the violence against Bangladeshi writers, publishers, and bloggers. Suddenly, despite there being over 260 million Bengalis, the world felt very small. There are other themes in this half as well. One of those themes is, of course, the evocative songs. The night before my interview with Parvathy, she gave a performance for a small gathering of academics. It was the first time the songs of Radha’s love, which I had heard countless times, truly reached me. Parvathy embodied the full intensity of Radha’s selfless love. Her expression transcended all stories about the elicit love affair, jealousy, unfaithfulness, societal risk – many aspects of the Radha-Krishna relationship that my feminist self is quick to critique. Yet as I watched Parvathy sing and express Radha-bhab, there was no doubt about the transcendent power of that love, and about how it transforms an individual living within the constraints of society to reach a higher goal. As I saw it that moment, it was not only love for another; it was love and compassion for humanity, for all of existence. It is not just love for the Divine; it is divine Love. This love empowers Parvathy to continue her work. It is also the love that motivates and empowers many others who, despite odds, continue to work toward a more peaceful and just world. In addition to my personal ruminations, there was another narrative during that evening performance. From the back corner of the room, the door occasionally opened, letting light stream in as someone entered or left. After several streams of light, Parvathy stopped her performance to ask that the door be kept shut to prevent distractions. This is important. Although Baul performances are seen as entertainment by many audiences and some performers, for others it is not at all about entertainment. It is intended to be transformative, to cause people to think and experience something different. Lisa Knight: But you said it with such grace and gentleness, and firmness at the same time! I admired that. Parvathy Baul: They can tell me that they accepted that I wanted them to stop interrupting, but still they might ask, “Why did you close the door?” But I did not close the door out of revenge. Do you know the story of the snake and the monk? So, at some point of time you must lock the door…[*laughter*]….with compassion! It was not revenge or anger. And if they sat through the evening, during this hard and painful time, they might realize something at the end. Because the songs are not done by this individual performing; the songs are the message of the masters. Every time the song is happening, it is an invocation of the presence of the master. So, the masters are talking to you. Not me. Because according to the discipline of the Baul, the singer must disappear. The singer is just a listener, just like others. There is no ego between us: I am singing, and you are watching me, or you are watching me, and I am doing it. All of that should go away. It should become song together. Both performer and audience are singing, and both are listening. Lisa Knight: Yes, there’s something that happens together. It’s like a conversation. The audience might think of themselves as passive and not necessary, but the performance can’t happen if they’re not present, if they’re not engaging. Parvathy Baul: Yeah, it’s because it’s two-ways. Lisa Knight: Two-ways, a dialogue. Lisa Knight: Right. Exactly. Like this interview. So, I have a question about Bangladesh and what has happened since ’71, when you had family in Bangladesh and some members left for India, and since ’72 when the new constitution of Bangladesh included secularism as one of its principles. Now Bangladesh has become increasingly Islamic in a narrow way. I’m wondering, from your perspective how would you respond to this increase in religious division, this increase in extremism and discrimination? Parvathy Baul: It’s very frustrating, actually, in one word. Frustrating. I have first-hand experience of this violence because many of my family members were fighters in ’71 and ’72, they were freedom fighters for Bangladesh. And at that time, many of them were killed. Like the person who looked after our house and who is from our community: he was beheaded when he was having his food, in his home, in front of his children. He was killed, his head was separated from…..I have lost family members in this violence, and it’s very, very sad. In 2015, when this violence happened, when they went inside the publishing house and attacked somebody, I was there in Dhaka. I was with Khushi Kabir. Lisa Knight: In October 2015? Parvathy Baul: In October, yes. I was there. I remember Khushi-di – I was staying with her then – how devastated she was that you don’t have freethinking anymore. We understand religion; we understand everything. But Bengalis, we have a culture that is Bangla culture, which is beyond religion. Bengalis love to read; Bengalis love to express. We have a tradition that gives birth to Lalan Fakir, Tagore, and many Baul practitioners. There are also people like Aurobindo. So, we come from that culture where people express themselves from different points of view. It was always a land of diversity – singing, dancing, women celebrating their womanhood. It’s part of our culture! If we just adopt an outside religion – the same thing as we tried with Communism, which we could not adopt properly. We just followed something that was not integrated into our culture. So, ultimately it collapses. Our real Bengalis are from this land, and the geographical and atmospheric environment around us, it creates the Bengali culture. And we are importing another culture and pushing it onto us. But that’s another culture, from a different environment. We are taking not the culture actually, but some narrow-minded understanding, which we do not really understand ourselves, and we are trying to push it in. Like the snake, who doesn’t know how to protect his snake-hood, so they don’t know how to protect this humanity. They are pushing something that kills the humanity and the broadness of expression of Bengalis. Whether it is Hindu or Muslim or Christian or anything in the world, I absolutely don’t support that method of forcing people. And as a Baul, of course not, that is not our philosophy at all. Khushi-di is a very, very inspiring woman, a model of fearlessness for me, being a Bangladeshi. The first time I met her, she said, “Parvathy, let’s break all the walls between us! Let’s break all the walls, through the Baul music.” And I said, “Yes, of course! I too will bring my hammer – my ektara – and I will break the walls!” And then, at that time [October 2015], she was going all around and meeting all these people who were wounded and attacked by extremists – by people who would go inside their office or private house and kill them…. in front of the children, you know? Forgive us, in front of children!! What trauma this child will carry for all their life. They’re spoiling somebody’s life, I mean they’re killing a person, but they are also killing so many other people because it’s like dying to carry this dead body with them, this image of somebody dying in front of them. It’s going to affect them all their life. Lisa Knight: And the next generation. Parvathy Baul: And the next generation! Because that horror will reflect onto all the people they will meet. So, it’s such a huge harm that we are doing to ourselves. The people who are doing the killing are the same people who live in the same land. It’s going to affect them as well. So, we are affecting ourselves – it’s foolishness! Absolutely. I still remember the government trying to give security for Khushi-di because Khushi-di is a very liberal person. And she says, “I will walk through the street, let them come. Let me see.” She says that. “In my country,” she said, “I will never walk with security. This is my country, too.” Khushi-di comes from a well-known family, but she fought for the security for other people, to give them help. That’s why I want you to meet her and really talk with her because she has been a strong activist against this killing, this mass killing. Lisa Knight: Yes, I hope to meet her. Parvathy Baul: And she’s the one who still does Pahela Baishakh, asking girls to wear colorful clothes and sing and dance through the street. Even now she’s the one doing that. Lisa Knight: She needs to be careful. Parvathy Baul: She has to be careful, but she doesn’t care. She is ruthless in her way. Lisa Knight: Good for her. A lot of people are being careful because they are afraid, and for good reason. Parvathy Baul: Yeah, exactly. But we should not do that. We should speak out so that it does not go to the extreme where everybody revolts. I was surprised. I took a car from Dhaka to Kushtia to the Lalan festival, and on the way there was this camp happening. Through the microphone they were announcing in Bengali that they are selling space in heaven with money. They told the people, “Give this amount of money so that all your sins are forgiven, and you will get a place in heaven.” And people don’t have enough education in Bangladesh. What we need is education, but not everybody is educated enough to make their own way because they do not know about the world. Only this much information is available to them. So, they follow what they hear and do not question it. Lisa Knight: So what advice would you give to people in Bangladesh or elsewhere who are facing discrimination or facing extremism? Parvathy Baul: It’s hard. Being in that situation and fighting such strong power that is so scary and violent…people are just trying to protect their family, so they just don’t say anything. Because, if they alone come up and say something, their family will be destroyed completely. I mean, what can you advise in that situation? So it’s not about what the people should do; it’s the authority that must take action.The government has someone who is more powerful and who must take the lead. Lisa Knight: Yes, I agree. That is an important point. Anything else you want to say that would be an inspiration? Or some lyrics that you think are particularly relevant for today? Parvathy Baul: I would like to share this song of Bhaba Pagla. Parvathy Baul: This song says: [Thinking about the song, Parvathy summarizes] Oh Divine, awaken in all the temples. You are the light of the time. You are the pure one. You keep the dignity of humanity, come back again. And through the ages you are the one who holds the shudharshana wheel [variously understood as the chariot, the discus of Vishnu, and the weapon that gives clear sight]that cuts through every falsehood and brings the truth back. You are the charioteer of Arjuna. You take him in the middle of the battlefield and give him the wisdom of the Bhagavad Gita. So, put the peacock feather back in your hair, come back and tell us the wisdom of Gita. You were born in all times when humanity was suffering, and you established the truth. And now, again the ignorance is the suffering for us. So, come back again, the Peacekeeper. Give us peace, that’s all we need. No more war. Lisa Knight: That’s great, a great image. Parvathy Baul: Should I sing the song? Parvathy Baul: With my ektara or just my voice? Parvathy Baul: The mandir is not outside; it’s the temple of the heart. So, the divine has to awaken in everyone, like what we were saying before. We need to overcome our own fears and insecurities. So, let love and compassion come and sit and take over. [*laughter*] There is a John Lennon song, right? You can call me a dreamer. But at least I’m not the only one. Many other Bauls say the same thing. Lisa Knight: Beautiful. It hits me right here. Thank you. Parvathy Baul: All my life I’m running around with my ektara and this song. Lisa Knight: Your inspiration to keep going. It’s such an interesting image, the Gita, when Krishna is with Arjuna and Arjuna is having all these doubts about what to do. Lisa Knight: Such a powerful moment of decision. Parvathy Baul: Very strong, very big decisions which we all must make at one point – or at many points – in our lives. Lisa Knight: It’s captured so well in that part. We think it’s all about life or death and that our action has a big significance in the world. And yes it does, but also it doesn’t. We become immobilized with indecision. Parvathy Baul: Even the small decisions lead us to the bigger aim. So we must be conscious and present with all decisions we make, with every little action that we do. Parvathy Baul: — thinking that it doesn’t really affect me, but it’s going to affect me. Because when we steer the water somewhere, it comes anyway. Small wave or big wave, it still comes. Lisa Knight: Perfect, thank you. I’m going to turn this off. I hereby declare this interview done. Parvathy Baul: I have been fierce, with my words, I think. I have been advised by many that I should not speak about these kinds of things because it affected me a lot, because I am so fierce in my “no!” to this. But, we have Khushi-di, and we have to support her. Otherwise, she’s alone. Lisa Knight: I will send this interview to you. Parvathy Baul: You definitely can write whatever I’ve said because it’s my decision, I’ve said that. As Krishna said, make your decisions with consciousness. You know, there are people who said to me that if you come to Dhaka, they will shoot me because I have many Bangladeshis students from Islamic background, girls and boys, and their families have threatened me like that. I sang in a Bangladesh stadium, there were one or two lakh people, and I sang “Jai Radha Radha Govinda Jai” because that’s part of my singing. I sang it boldly, I didn’t pretend that I am not a Vaishnav. I am a Vaishnav. I love Radha and Krishna, I don’t have to adjust that. So, I sang, and I told everybody to sing with me, and when I said to sing with me, it was not my intention that I was asking a Muslim country to sing with me. It was not my intention. So, I sang, and they responded, and later there was a huge writing that I was trying to convert and spread Hindutva in Bangladesh. It was not my intention at all. The people sang because Radha Govinda is part of their culture. It is Bengali culture. Lalan has written many songs on Gauranga. Muslim fakirs have written the best bicchedi gaan [songs of separation]about Radha. You know that. Parvathy Baul: The most beautiful songs written for Radha are by Muslim fakirs. Much better than Vaishnav. And now they are killing that culture of acceptance. Our culture has been rich with acceptance of each other. Lisa Knight: — came out of that whole mixture of people and ideas. It’s incredible. I don’t know of many places like that. Parvathy Baul: Everyone came from that side. 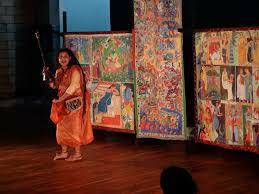 Parvathy Baul: Even the whole Manoharshahi gharana [a famous Vaishnava lineage of Kirtan singing]was from Sylhet. Sylhet is the birthplace of more than 15 schools of fakirs, of Bauls. And the number of poets born here: Radharaman is from here, Hasan Raja is from here. If you just look at the history of that district. Lisa Knight: And then Sylhet became one of the most conservative places in Bangladesh. Parvathy Baul: Yes. Can you imagine this? This was a birthplace of music! So many Indian ragas were created in the royal palace because many of the kings and landowners were very supportive of music. And now singing is banned. Lisa Knight: Yeah. When I was there in 2000 in Sylhet, trying to find women singers, it was very difficult because I would go places and people would say, “Oh, women don’t sing in this country.” And I would hear a woman singing in the background at the mazar when this person was telling me “No, women in our country don’t sing.” Really? Even the people I was staying with, who were sympathetic – one of them was a Baul singer – they made it difficult because they were feeling the pressure of conservatism. There was stigma that you can’t be a singer or performer or Baul and also a respectable woman. Parvathy Baul: I was so surprised. I was sitting in the Lalan Fakir Mazar when the Bauls were singing and the azan [call to prayer]started, and they had to put down their instrument and stop singing. I was surprised. A Baul never stops singing – because they are also calling God! Lisa Knight: Did that work? Parvathy Baul: Yeah, I just had to put a small band here, so that there was one piece of cloth, and I said it was sculpture, and that I worked on it for 20 years. They had to accept it. It is not hair, I said. I made it. Lisa Knight: It has gotten long! Parvathy Baul: Very long! It’s longer than me. When I met you it was this long [pointing to her middle back]. Parvathy Baul: I step on them, actually, but I remember the hair, so I keep my feet away. I know where to take my feet. But, the hair gives me so much awareness of the space because in a way it binds and restricts me from my movement, so I don’t overdo anything. I am very present, it keeps me in the present. Lisa Knight: I saw that, the way that you moved your hair sometimes from where it was in the way. Very consciously. You were not disturbed. Parvathy Baul: I like that it’s long because it helps to keep me present, so that I’m not everywhere. Parvathy Baul: No, it’s so nice to spend time. 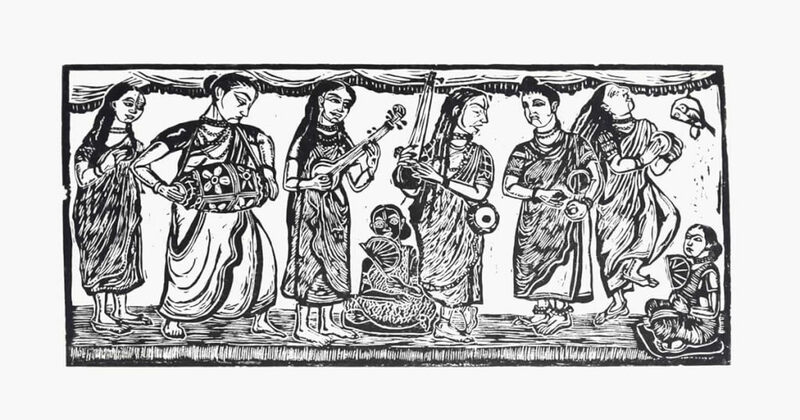 Woodcuts were made by Parvathy Baul and Ravi Gopalan Nair. Thanks go to James Bergman who helped transcribe the recorded interview. James is a student at Furman University, majoring in Religion and Anthropology, and minoring in Latin Studies.